We all know kids can be wild about ants, too. If that’s the case, they might be interested in a new picture book I found at the library yesterday, Just Like Us! Ants by Bridget Heos and illustrated by David Clark. The book is set up as a series of two-page spreads on different topics such as “Sister Cities” and “Bug Eat Bug Job.” You might not be able to see from the image of the cover above, but each spread features a photograph or two of real ants (photographs by Alex Wild) surrounded by cartoons. Although the cartoon illustrations may make it look like this isn’t a serious book, don’t be fooled. Serious facts and concepts are discussed, but in a lighthearted way that will attract the most reluctant of readers. Throughout the author compares what ants can do to what humans do, making them more relatable. What I like is it is not simply a rehash of older books. The author reveals recent scientific discoveries, such as how bigheaded ant larvae process food for the colony or how fire ants build rafts to float on water. That’s nice to see. If you know a lot about ants, you might quibble about the wording here and there. For example, “all ants in the colony come from one mother” might make you pause if you know about polygyny. However, by and large it is a case of keeping things simple enough for children to grasp readily and it works overall. Just Like Us! 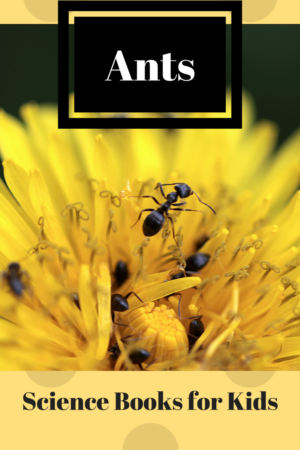 Ants gives an up close and personal look at how ants do things that are remarkably similar to the way humans do, and it is an accurate and informative introduction to the world of ants that is perfect for young readers. Check out a copy today. Looking for more children’s books about ants? See our growing list (organized by reading level and genre) at Science Books for Kids.